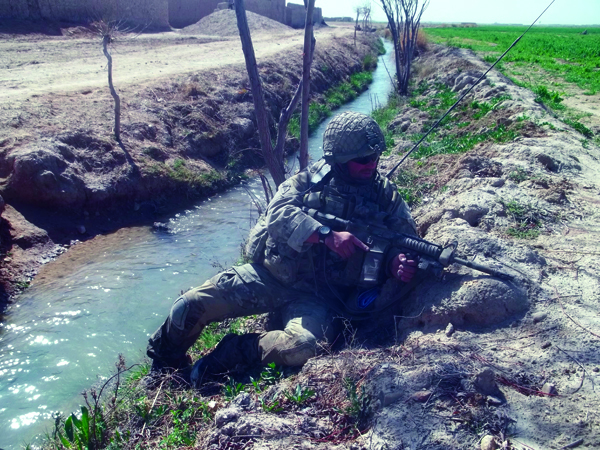 Mark Corby got it wrong about modern British Army performance, argues paratrooper Tom Blakey. With over 23 years’ service, I have served on operations in Northern Ireland, Kosovo, Macedonia, Iraq, and Afghanistan (multiple tours of each, except for the Balkans operations). After reading Mark Corby’s Opinion piece ‘Falling Standards’ in MT 13, I was left feeling disappointed and angry. He first referred to UK casualties and the general public’s response to them. I could not believe his attitude. The figure he gave was 378 dead since 2001. However, only five of these were killed before 2006. Therefore, since the main deployment in 2006, there had been 373 killed – in five years rather than ten. Four more have died since he wrote. Not to mention 1,792 wounded in action, and another 3,440 casualties from disease or non-battle injuries. Many of these casualties have suffered horrendous, life-changing injuries. Surely the general public’s interest in the matter and their show of respect at repatriations is a great thing – not something that is ‘frankly mawkish’? The second issue raised concerned the adoption of the SA80. Corby questioned the infantry’s use of an automatic-fire weapon. He is of the opinion that British soldiers are wasting ammunition by firing their weapons on automatic, implying that we are comparable with the Americans, and that this is resulting in collateral damage. Corby could not be any further off the mark. I have fired my personal weapon many times on operations, and the selector lever has always been set to repetition. Massive emphasis is placed on firing only aimed shots, at positively identified targets, and on taking every measure to avoid civilian casualties – just as we were trained to do in Northern Ireland. This is not a reaction to events on operations: it has always been the policy. However, due to the tempo and nature of operations in Afghanistan, much more ammunition is being expended than on an Internal Security operation such as Northern Ireland. It is the tactics of our enemies – not the frivolousness of our troops with deadly force – that often lead to civilian casualties. Then he virtually mocks our armed forces, claiming, given our technology, that we are fighting a one-sided battle in Afghanistan. Obviously we do have all of the advantages in that field. The Taliban, however, have many advantages that we do not. They are not obliged to adhere to any Rules Of Engagement (ROE) or to answer to the world’s media if a wrong call is made in the heat of battle. The Taliban also know the lay of the land and quite often have the support of the local people. More often than not, it is they who choose when to initiate an engagement, only doing so when they believe they have everything to their advantage. Corby’s final criticism really annoyed me. The reason so many serving soldiers are wearing more medals than ever before is that they have been on more operations than ever before. The fact that, in the 1960s, all that was issued was a GSM with various bars does not mean that should be the case now. I would argue the opposite. I have a good friend who served in Borneo, Aden, and Northern Ireland, and all he has is one medal with the relevant bars. Surely this is not the right way of recognising his service? I found Corby’s comment that in our ‘modern society everyone gets a prize’ particularly arrogant. One of my soldiers has done three very hectic tours of Afghanistan, yet has only one medal. In fact, the standard for receiving a gallantry award has been raised far higher than it was ten years ago – due to the frequency of brave acts undertaken in Afghanistan, and previously in Iraq. What would once have merited an MC would now probably be dropped to an MID, or might not even be recognised. Are Mark Corby’s opinions tinged with professional jealousy? Whilst I agree that the armed services are going through a very tough time at the moment, with restructuring due to the current financial climate, the soldiers at ‘the sharp end’ are doing a fantastic job in the very difficult circumstances and harsh environment of Afghanistan. We currently have the most operationally focused and experienced Army since the Second World War. Definitely not one with ‘falling standards’, but an organisation of which the country should be proud. Tom Blakely is a serving senior NCO in the Parachute Regiment.